What is Front Office Management? 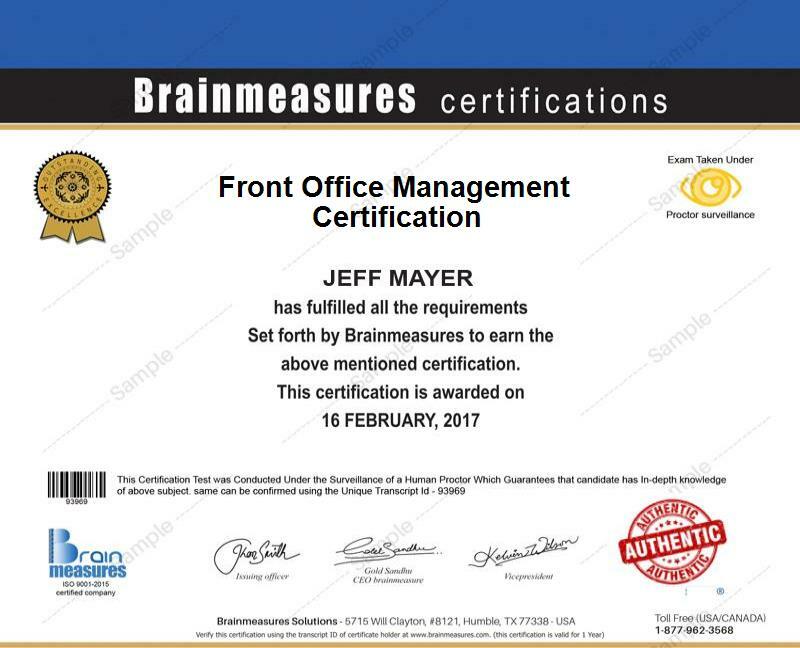 If you want to be responsible in managing the front office of a business establishment, then you have to consider enrolling in the front office management certification course offered by Brainmeasures as this is the only way for you to fully understand everything that you want to learn about this specific field. The front office management course which you can now access at Brainmeasures makes it a point to simplify all the complex elements and components of the front office department so you will no longer have a hard time understanding them. With the help of this certification course, you allow yourself to undergo an extremely comprehensive front office management training which covers all the aspects, principles and concepts related to managing a front office and this makes it possible for you to be able to perform all your responsibilities in a more efficient manner once you start to work in this profession. The more simplified versions of all the complex front office management aspects also make it easier for you to successfully handle the online front office exam which forms part of the program, pass it and finally receive your certificate. How to meet and greet guests and guide them to their excellent room accommodations? The front office management certification program offered by Brainmeasures aims to help individuals and professionals who want to start working in the front office department of a business establishment especially hotels. You can expect this program to work even more suitably for aspiring and existing front office managers, front desk agents and front office supervisors who are in charge of making sure that the front office department continues to provide excellent services to the public. Your front office management certification is also your ticket towards starting to improve your financial condition. It is because those who have successfully completed a front management certification course get the chance to receive a higher pay. If you work as a front office manager, then your annual salary can go around $40,000 to $63,000. If you get directorial positions after you complete the certification course, then you can expect this to let you earn an annual salary of $68,000 to $82,000.